I’ve published a few posts about the question of playing background music in the classroom, along with info on the practice of listening to music when studying. I thought I’d bring them together in one post, and invite readers to contribute their own ideas and experiences, too. I’ll be adding this “Best” list to The Best Resources On The Dangers Of Multitasking. 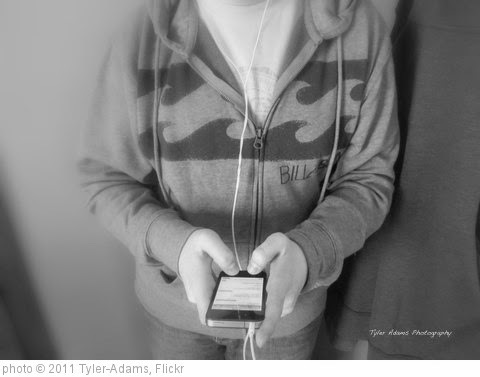 A study find that listening to music while performing a task can impair cognitive ability. The most accurate recall occurred when participants performed the task in the quieter, steady-state environments. Thus listening to music, regardless of whether people liked or disliked it, impaired their concurrent performance. This reflects my experience in the classroom (and my own personal experience). I use music a lot with English Language Learners as parts of lessons, and use music in lessons with our mainstream English classes when studying Bob Marley and, also, New Orleans. But they are always specific parts of lessons. Any time I acquiesce to student pleas to let them listen to those music examples outside of those specific lessons — for example, if they are working on a group project or during silent reading, it becomes an obvious distraction and I usually turn it off relatively quickly. However, there is an important caveat — I have found that a few students who face particular challenges actually work better if they are listening to their own mp3 player at times, and have made individual agreements to let students sometimes use them. Several years ago, when I was teaching a particularly challenging class, having students close their eyes for a couple of minutes after lunch and listen to soothing music also worked well as a calming influence. But they did not have to perform any task other than calming down, and the study does point out that music can “very positive effect on our general mental health” in that kind of situation. Another study has found that working in quiet is the best atmosphere for cognitive work, listening to music you don’t like is next, and listening to music you like creates the worst cognitive atmosphere. Don’t Listen to Music While Studying is useful post from Edutopia. Here are two decidedly different recommendations on music that might be conducive to a classroom environment — one from The Atlantic and the other from teacher Jon Harper. Does music really help you concentrate? is from The Guardian. People May Be More Cooperative after Listening to Upbeat Music is from Scientific American. Why scientists think your boss should play music while you work is from The Washington Post. Neil Jarrett has created a Spotify playlist of “Music For The Classroom” of nearly 900 songs. Drowned in sound: how listening to music hinders learning is from The Guardian. …background noise, speech, and music all have a small but reliably detrimental effect on reading performance….Intelligible speech and lyrical music resulted in the biggest distraction. Should Students Listen to Background Music While They Read? is from Daniel Willingham. Okay, I’m all ears. Please share if your experience agrees, or disagrees, with this research…. In my (albeit brief) research I learned that different parts of the brain are being used when students are reading/writing/listening/speaking to language and when they are listening to soft music without lyrics. As a result, I’ve decided to play classical music in the background. I randomly fell upon this website and read what this author had to say. Well, I disagree that listening to music while studying hinders the quality of studying you do. I do agree that listening to music that you like, for example that new pop song on the radio, will hinder your studying abilities. But I have found in my own experiences that listening to happy, instrumental music while studying does not hinder my studying. I still find that I am able to reflect on what I just read and explain the topics. I have also found that it helps me do math homework. I appreciate the views and insights of the author, but I just wanted to share my own thoughts.